The countdown to the Brewers Opening Day is underway and as tailgaters and fans are getting ready for the start of the baseball season, officers are preparing for a busy day out on the roads. WAUWATOSA — The countdown to the Brewers Opening Day is underway and as tailgaters and fans are getting ready for the start of the baseball season, officers are preparing for a busy day out on the roads. Wauwatosa Patrol Lieutenant Luke Vetter said they will have extra officers out on the roads assigned to gameday traffic stops. "Wauwatosa itself will be deploying officers right during the sweet spot of Miller Park opening and then the game closing so there is extra enforcement and Wisconsin Ave. and Blue Mound Road," Lt. Vetter said. Those officers will be looking not only for the obvious drinking and driving signs but also for minor infractions. "Taillight out, registration may not be current they are going to stop the public for that because they want to get up to that car and they want to find out if that driver is impaired," Lt. Vetter said. "If they are not we are going to get them on their way with a warning as soon as possible so our hope and goal is with the high level of traffic contacts, the odds are going to go up of us finding those impaired drivers and arresting them. So we ask that the public is patient with the officers." The lieutenant said it cost about $50 to get to Miller Park and back from Wauwatosa, but if you're caught drinking and driving, that could cost $800 or more.
" We want them to use all the other resources available. Shuttle rides from bars, phone apps that can get them a ride quickly, could bus even offers rides as well," Lt. Vetter said. According to the Milwaukee County Sheriffs Office, in 2018, the day before and after Opening Day, there were 2 OWI arrest. 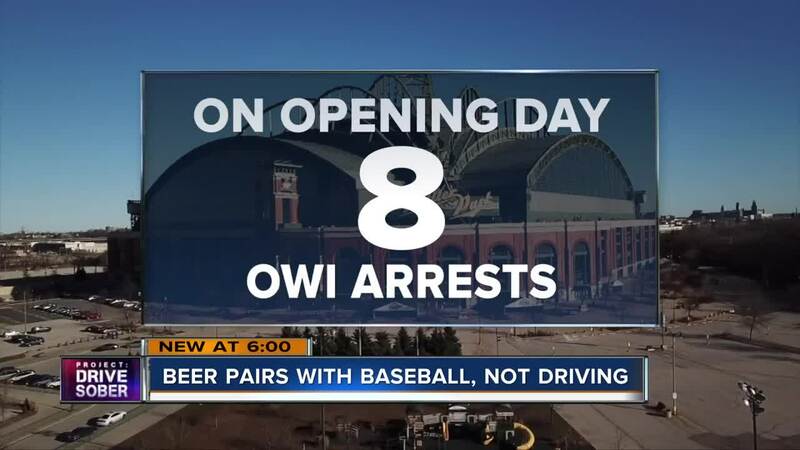 On opening day itself, there were 8 OWI arrest. Defense Attorney Julius Kim said on opening day he sees a spike in clients seeking his services. "I think that a lot of times people look at tailgating as an opportunity to go and have fun, certainly, but also to drink," Kim said. "I think that corporations and I think organizations like the Milwaukee Brewers and the Green bay packers, they also can help contribute to solving this problem by not fostering a drinking culture within tailgates." Lt. Vetter hopes people enjoy the game tomorrow but wants them to celebrate responsibly.